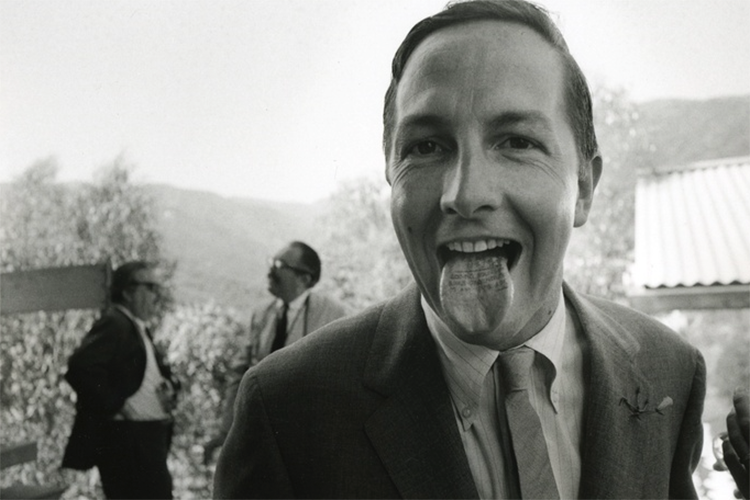 A selection of photographs and billboards creamted by actor, director, photographer and artist Dennis Hopper will feature in a dedicated online auction by Paddle8. The sale 'The Artist: Dennis Hopper,' which was curated in collaboration with the Hopper Art Trust, runs from until 27th October and will offer 18 rare works by the American icon, consisting of special edition prints created exclusively for Paddle8 and three unique billboards. Between 1961 and 1967, before making his directorial debut in 1969 with the landmark counterculture film Easy Rider, Hopper took thousands of pictures, primarily candid shots of bikers, hippies, actors, musicians, and artists. These relaxed and intimate photographs show Hopper's strength as a portrait photographer, including candid shots of his friends Andy Warhol and Robert Rauschenberg, actor Paul Newman and the rock band The Byrds. The scenery Hopper captured is America in concentrated form: endless highways, gigantic billboards and broad boulevards. In the 1960s, several of his friends were creating billboards as a way to support their art, and through them he became acquainted with professional billboard artists whom he commissioned to translate some of his photographs into large-scale paintings. He then learned their craft and created his own paintings based on his photographs, expressing the medium in full circle. Marin Hopper recalls: ''If you’re a person who genuinely wants to change the world, you're going to be multifaceted in your creative expression. My father was always looking to make things happen, always evolving, always discovering new outlets for his vision.'' The particularly sought-after work Double Standard, 1961, represents a brilliant example where Hopper’s early photograph served as a basis for a huge painting. All lots in the sale are offered with an immediate Buy Now option, with prices ranging from £2 000 to £4 500 for special edition photographs and prices for original billboards ranging from £65 000 to £245 000.